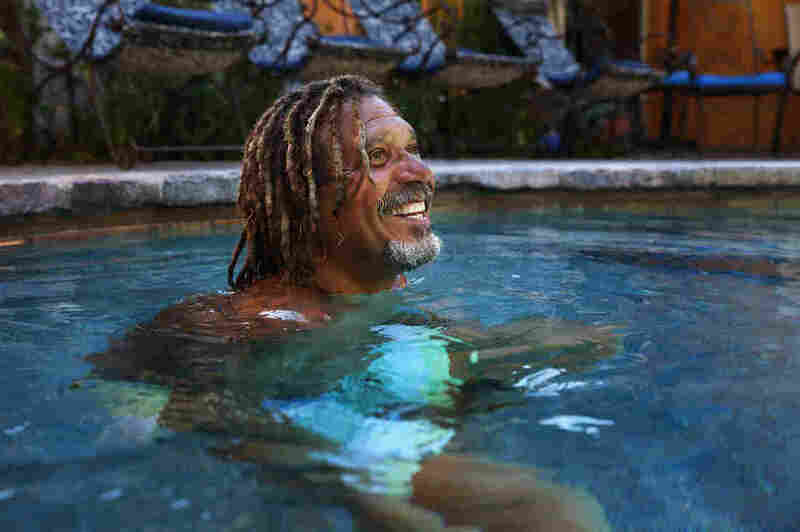 The 'Swim Whisperer' Teaches Kids To Be Water-Safe : NPR Ed For 20 years, Conrad Cooper has been helping children in Los Angeles learn to swim by earning his young students' unwavering trust. For 20 years, Conrad Cooper has been teaching children in Los Angeles to swim by earning his young students' unwavering trust. Conrad Cooper has been teaching little kids (and some adults) to swim for 20 years now. His business, Swim to Me, operates out of his pool in the View Park neighborhood of Los Angeles. He has taught kids who scream with fright at being put in the water, and adults who never thought they'd ever be able to swim. "After two or three times in the pool with me," Cooper says, "they recognize, 'OK, this guy is serious. He's not taking no for an answer. I'm going to do this.' "
His families come from around the corner and across the ocean, because word of his effectiveness travels. "He does not fool around," parents will tell you, "but it works." It's not a method that works for everyone. "If you think this is someplace you can come and do monkey-walking by the side of the pool and sing songs ... you're in the wrong class," Cooper says. A tall brown man with sun-bronzed dreadlocks and Pacific Islander tattoos, Cooper radiates authority, in and out of the water. Helicopter parents are politely instructed to find a landing place in one of the comfy chairs that ring the large saltwater pool — and stay there. Parents who want Cooper to teach their children have to promise to abide by his rules: They're there to support the method, not to comfort their children. Two boys wait for their turn to swim, on the edge of Cooper's pool. A few parents have dropped out over the years. "We're very clear that it's not for everybody," Cooper acknowledges. A slim number find his method too strict and leave. Or never sign up in the first place. But their empty slots are quickly filled by others on a waiting list. The lessons are an hour each and run over five days. The cost is a little over $200. 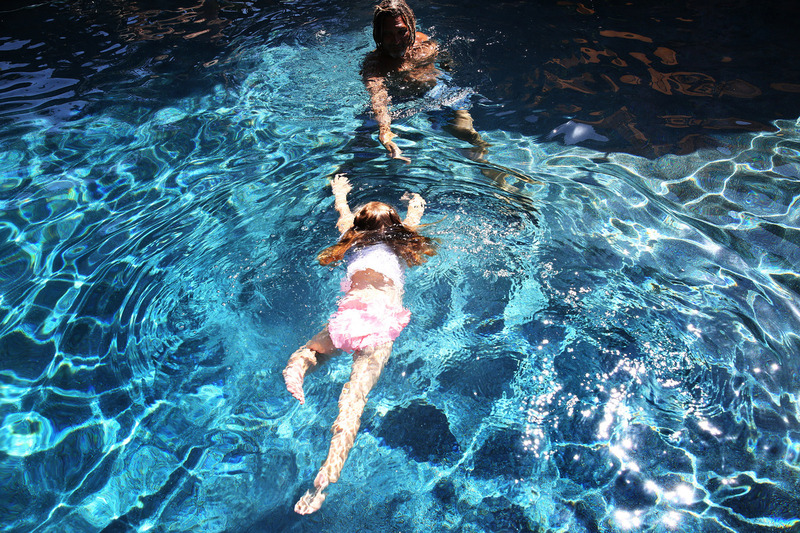 Cooper began teaching in the 1990s, after he and his wife, Londa, bought a home with a pool. They hired someone who taught their niece and several of her friends to swim, and Cooper, who'd been looking to move out of sales work, thought this might be something he could do. In 1995, he began teaching full-time, and Swim to Me was born. Cooper is known as the Swim Whisperer. He's been teaching swimming full-time since 1995. He and Londa divide the labor: He teaches, she runs the business, scheduling classes, booking students, keeping everything running smoothly. It's a relaxed environment. The trees around the pool are hung with chimes that tinkle softly. Light jazz is piped through hidden speakers. Cooper gently instructs and encourages. He sometimes throws in a little etiquette tutoring: "Conrad, I burped!" one little boy tells him gleefully. "You did? Well, what do we say when we burp?" Cooper asks. "Yes, excuse me. Very good." One by one, kids leave the pool stairs and swim over to Cooper. "Kick, Logan, c'mon, kick those little legs." Logan McRae, who's wearing swim diapers, puts his little hands into Cooper's big ones. He has powered himself halfway across the pool. "Atta boy, Logie! Where are you going to swim next?" Silently, Logan points at his seated parents, and looks to Cooper for approval. "You're swimming to mommy and daddy?" "OK, then, don't forget to kick!" After the first half-hour, the kids get to vary the routine, by jumping off a huge granite rock that's on the side of the pool's deeper end, which causes much hilarity and some parental spritzing. And despite insisting that there's no bubble-blowing or game-playing, when Cooper wades to the shallow end and holds aloft a clutch of plastic toys, the kids squeal with excitement. There's a sea star ("Not a starfish!" Cooper scolds), a stingray and an Ariel from The Little Mermaid. He tosses them all in the water. Each child chooses a target, then dives down and emerges, grinning, prize in hand. By the last day of class, students in Cooper's class have made a lot of progress. Parents say they're amazed at the transformation. Parents say they're amazed at the transformation. Meredith Harper points to her daughter, Dove. "You see the results. On Monday she couldn't swim," Harper says. "Friday she can swim. It just speaks for itself." Caroline Collins says 5-year-old Nate was one of the kids who cried for the first couple of days, but they kept at it. "And by the end of the week, he was jumping off that rock. And he had no swim experience prior to Conrad." Cooper says his students don't need prior experience. "Swimming is the easy part," he says. "It's the trust part that's the most difficult for them." And he's earned it. His students leave him with hugs, high fives and kisses. And last year, some of his early students returned with their own children. "That's rewarding, I love that," Cooper says, as he goes out to greet the next class.